These 10 oz silver bars are crafted in pure silver bullion by some of the world's most highly regarded silver bullion refiners including Johnson Matthey, Engelhard, and PAMP Suisse. These 10 oz silver bars are the perfect choice for those who value quality but are not brand-conscious. Recognized by silver bullion dealers around the world, 10 oz silver bars retain their silver bullion value regardless of their brand, age or condition. Why sell 10 oz Silver Bars to Kitco? Kitco is a trusted leader in the silver bar and physical precious metals industry. 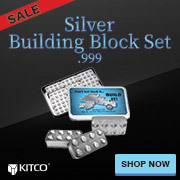 Silver bars and other precious metals sold by Kitco are recognized in silver bullion markets around the world. With our focus on silver bullion, you can benefit from silver bar pricing and premiums that are highly competitive in the industry. At Kitco, we make it easy for you to manage your tangible wealth. You can buy and sell silver bars and other precious metals using our convenient online store, or by contacting our team of highly trained precious metals specialists. Backed by our global information network, Kitco is proudly serving our customers since 1977. The 10 oz Silver Bar(s) you receive may likely be toned due to the natural oxidation that happens over time, and may have nicks or scratches. They do contain 10 oz of pure silver and therefore their value does not get affected. The 10 oz Silver Ingot(s) you receive may be manufactured by a different refiner and may appear different from the 10 oz Silver Bar(s) illustrated here.